In celebration of Black History Month (and her own birthday!) song stylist Rhonda Benin presents "Love Letters Make Me Misty Blue," bringing to our stage music of the great unsung soul divas of the 1960s, like Martha Reeves, Ketty Lester, Gladys Knight, and Betty Everett. Dorothy Moore's haunting soul classic "Misty Blue"...Koko Taylor's raucous "Wang Dang Doodle"...Betty Wright's classic "Clean Up Woman"...all this and much more is yours at tonight's "souled-out" show! 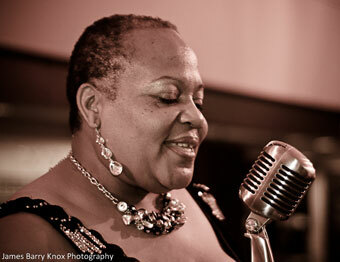 Rhonda first brought her sweet, sultry vocals to the Bay Area in 1989, working with Maria Mauldar in San Francisco. In 1992 she joined Linda Tillery and the Cultural Heritage Choir, an internationally acclaimed vocal ensemble performing African American roots music. Rhonda also has her own band, Soulful Strut, which she describes as "a jazz band drenched in soul with a solid helping of the blues." Rhonda is 2010-2011 artist in residence at Manzanita, Longfellow, and Jefferson elementary schools. She also facilitates Cal Performances and is on the teaching staff of The Healdsburg Jazz Festivals, Jam Camp West, and Jazz and Blues Camp for Girls. Tonight, Rhonda's soulful vocals are backed by a hot band featuring Tammy Hall (keys), Lorenzo Hawkins (keys, horns, and strings), Gregory Simmons (bass), Martin "Joey" Truso (drums) and Charles Spikes (guitar).